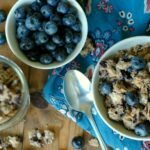 Paleo blueberry granola will bring a sweet blueberry taste and a light crispy crunch to your breakfast bowl and snack time! 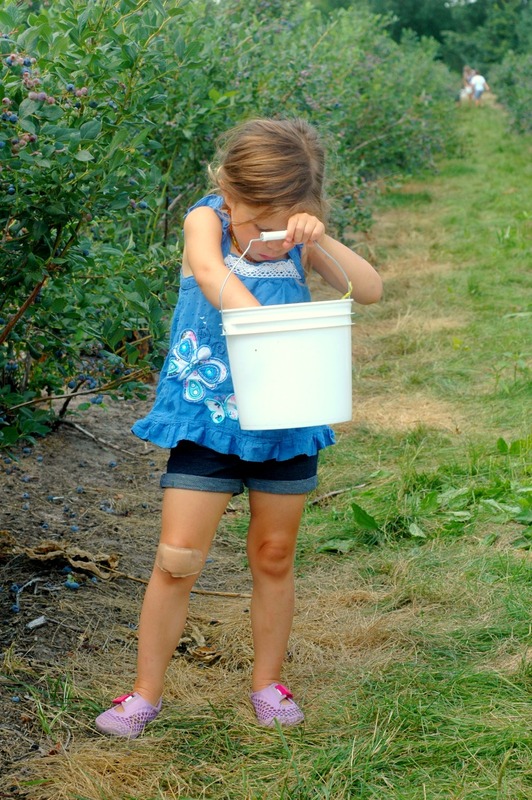 Sun kissed hair, scraped up toddler knees, sandy feet…and bottomless buckets of blueberries! I haven’t even gotten a chance to freeze any blueberries this summer yet, as my crew of 3 hungry, growing kiddos has been devouring them by the pound! We’ll see if I get a chance to freeze any of those pretty berries, but this week, I tried preserving some of the blueberries into granola, and the result was…delicious! Homemade granola may sound like a daunting task, but hear me out! 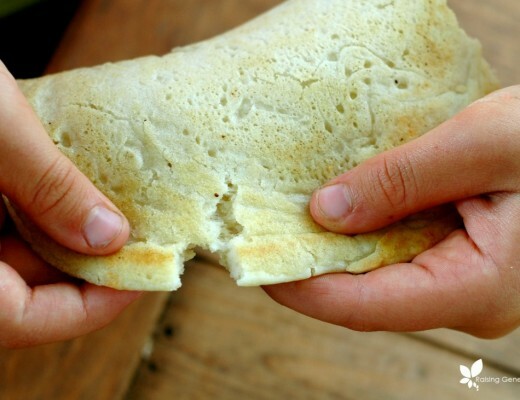 This is just about the easiest, most forgiving type of food you will ever make! Those of you who know me well, or who have been following my blog for very long, know that baking is not my favorite kitchen task. I set up my blueberry granola to dry out in the dehydrator overnight. I always look forward to the smell of warm granola the next morning, so overnight dehydrating is my favorite. But friends….oh my! The scent of warm blueberries when we woke up that morning was like nothing I have ever made before! Everyone – including my (not real blueberry loving) husband noticed how amazing it smelled. 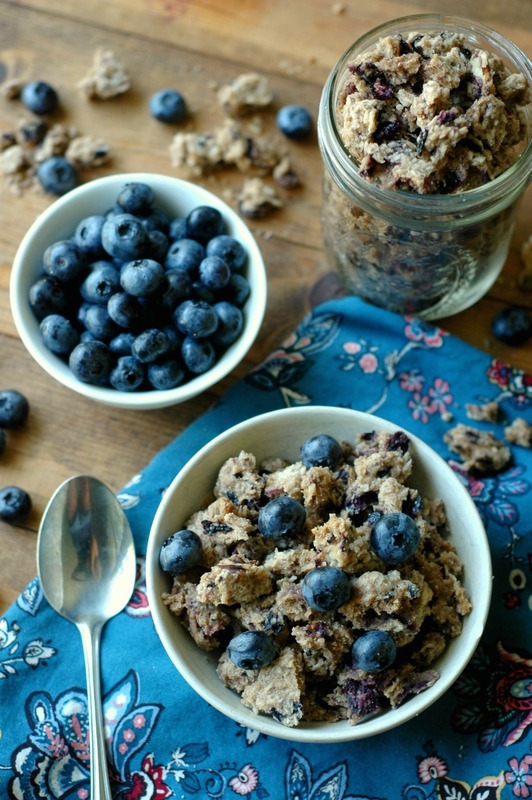 The little flecks of dried blueberry infuses this granola with the most amazing flavor too. 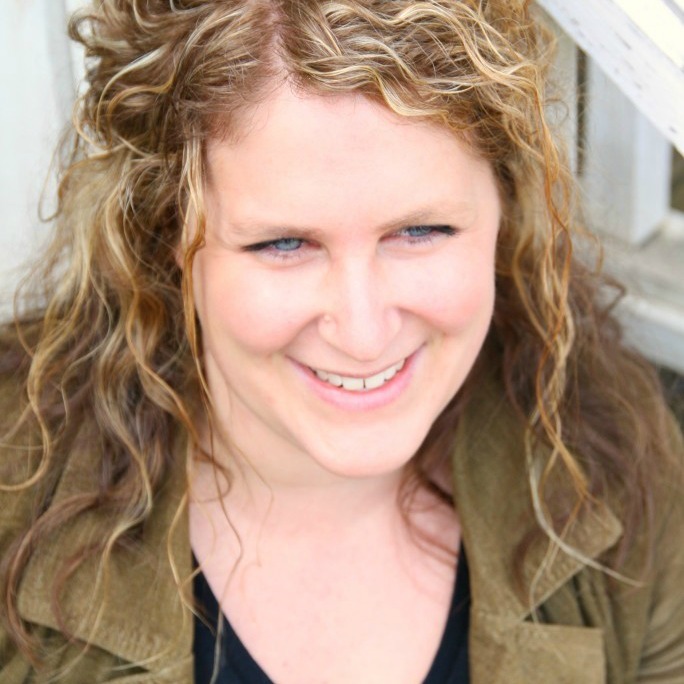 Here are my ingredient swap thoughts. Again, granola is pretty forgiving, so as long as the fat (oil) and raw honey are about the same, you can swap around the dry stuff as much as you want. For the nuts and seeds, I used a combo of walnuts, sunflower seeds, and pecans. If you are nut free, use all seeds – pumpkin, flax, sunflower, chia are all good choices! I used soaked/dehydrated nuts/seeds for best digestion. I used coconut oil for the fat, but you could use butter, avocado oil, or olive oil. For the raw honey, start with 1 cup and add to your taste after tasting the granola mixture. I used 1 cup which was sweet enough for my crew that isn’t used to super sweet cereal. I chose to pulse the blueberries a few times before stirring them in. 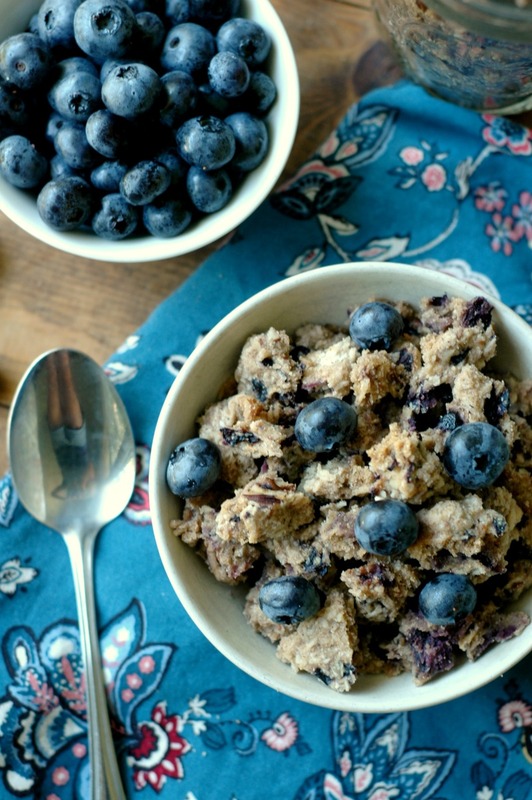 I wanted the flavor of the blueberry infused in the granola, and that definitely happened! If you prefer to keep your blueberries whole, I think that would work. Just keep an eye on the blueberries to be sure they dry out completely or they will go bad quick. Stir the buckwheat, water, and sea salt in a large mixing bowl. Cover the bowl with a towel and let the mixture soak 7-10 hours. This soaking process makes the seed easier to digest and makes the nutrients more available to absorb. After the buckwheat has soaked, add the rest of the ingredients and combine well. Spread the granola mixture over your dehydrator trays (I line mine with these "clean screen" tray liners since this mixture is wet and can fall through large tray holes), and dehydrate at 135 degrees until dry. This time will vary depending on how well your dehydrator keeps its temperature, how wet your mixture is from the blueberries and water, as well as how thin you spread the mixture out on the trays. Should be anywhere from 12-24 hours. It will continue to crisp up as it cools too. You can dehydrate at a higher temp such as 165 degrees and have it dry out a bit faster if you want. 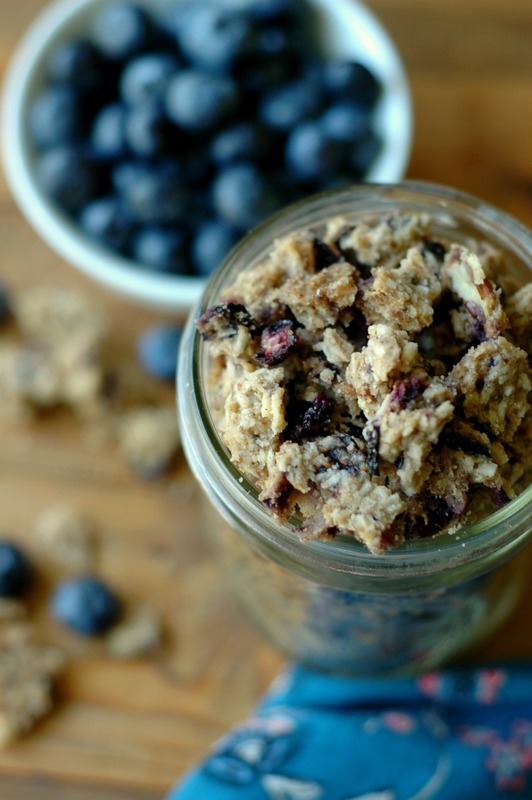 When the granola is dry, you can crumble it into an airtight storage container and keep it in your pantry. I like to keep some larger pieces for easy snacking too. 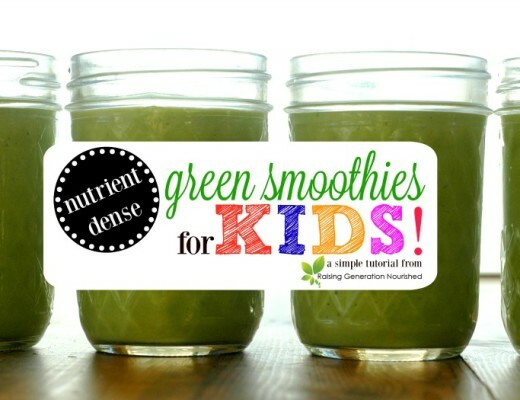 Nutrient Dense Green Smoothies For Kids! I love that you mention all of those swaps and how flexible it is . This granola sounds SO good! Love those beautiful blueberries in it. This looks so delicious!! I don’t have a dehydrator so I wondered if it’s possible to make it on a low setting in my oven? I think that could work! Just make sure you stir it around every half hour or so, so that the bottom of it get some air to it and it dries out evenly. Let us know if you give it a try! 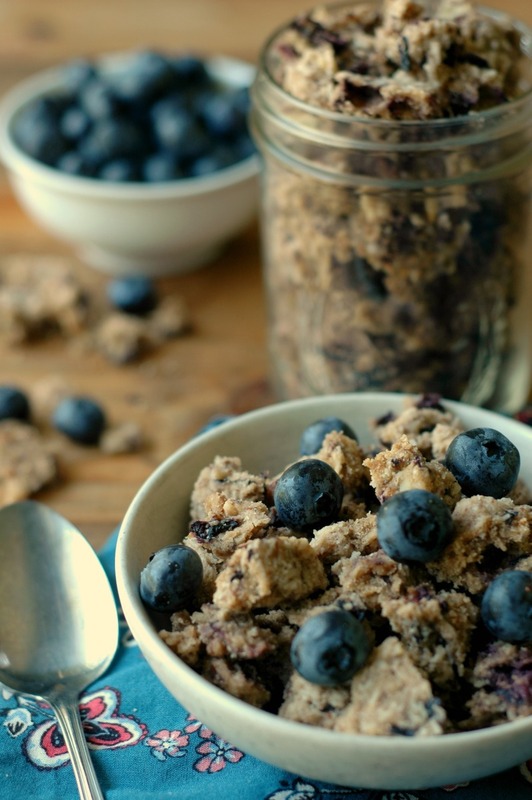 Blueberry granola- this looks and sounds delicious! What a great way to use up those fresh berries! This sounds so good! I love that you dehydrate it instead of baking to preserve the nutrients. Love the addition of blueberries! I’m always packing granola along for all our summer adventures! Also I’ve just been loving all your pictures this summer of your kids out picking fruit and then the recipes that go along with! This sounds like an awesome breakfast idea! About time I mix it up from my normal eggs + ham! Those crunchy clusters are perfect! 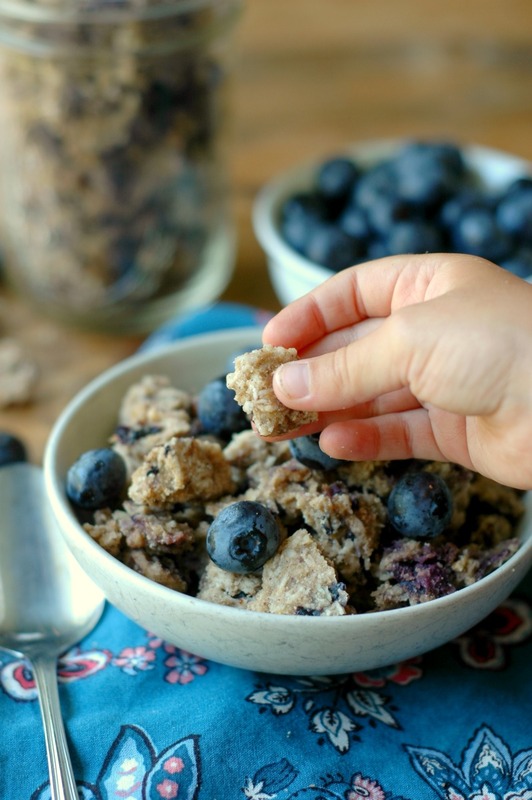 Love blueberries and this is a wonderful breakfast recipe for everyone to enjoy ! My kids are going to LOVE this. I never buy granola. But homemade is so good! This looks and I’m sure tastes delicious – and I love the photos too! Thank you for these great ideas! 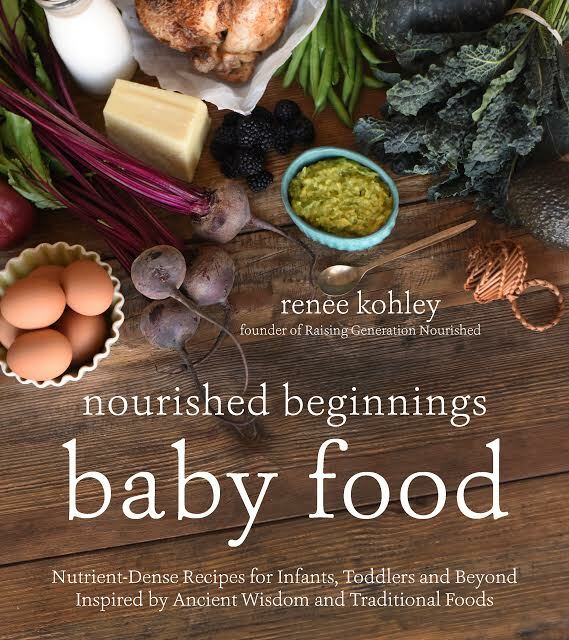 You always have the best recipes for sending a family into their day nourished! 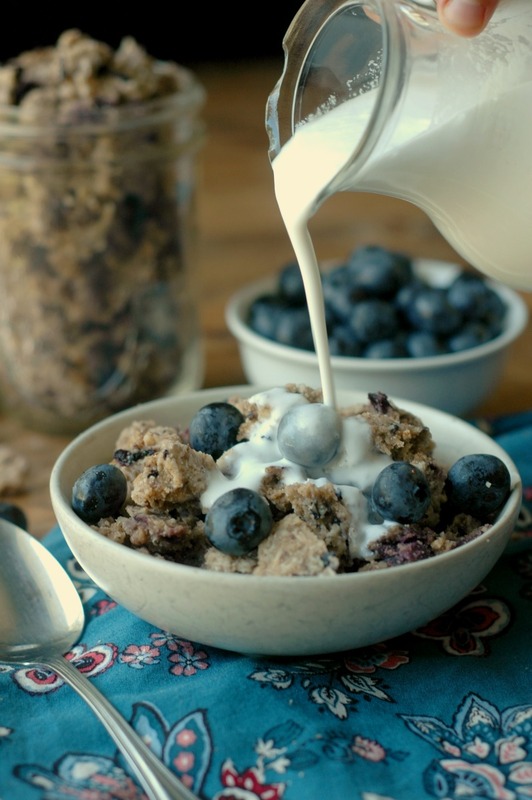 Blueberries and granola are a match made in heaven! Looks so good! This sounds delicious! Do you think this would work with frozen blueberries? Hi Erin! Yes, it should – just thaw and drain them first!